Certain individuals stand out from the Long Eighteenth Century – they could be aristocrats, politicians, scientists even writers and actors. But during my research into women in the world of entertainment (if the term is taken loosely!) I have found two Theresas who have further piqued my interest. “.. Teresa, the daughter of the actor Imer, … then aged seventeen, and pretty, wilful and a flirt, who was studying music to make a career of it on the stage, who was forever showing herself at her window” (see History of My Life by Giacomo Casanova). Teresa was to be one of Casanova’s lover’s off-and-on for several decades and was to have at least one child by him. It seems probable that the young Teresa had a reasonable successful singing career in the 1740s and early 1750s – she played Vitellia in Tito Manlio (an opera in three acts by Vivaldi) in the 1742 Florence season and performed in Padua, Turin and Genoa. At some point in the mid-1740s it appears that she married a dancer called Angelo Francesco Pompeati by whom she had a son. At around the same time Teresa came to London for the first time and performed at the King’s Theatre. A decade later she was to return to London with the help of a Dutch merchant (another lover) called Jan Cornelius Rigerboos (from whom Teresa adopted her new surname) and performed with John Freeman aka John Fermor or Sir Frederick Fermer, a cellist and double-bass player. Their performances took place at the Little Theatre in the Haymarket in October 1759 and she used the contacts made during this time to gain the support of members of the aristocracy to establish subscription assemblies that she and Fermor would run together. Her supports included Elizabeth Percy, Countess of Northumberland and Caroline Stanhope. 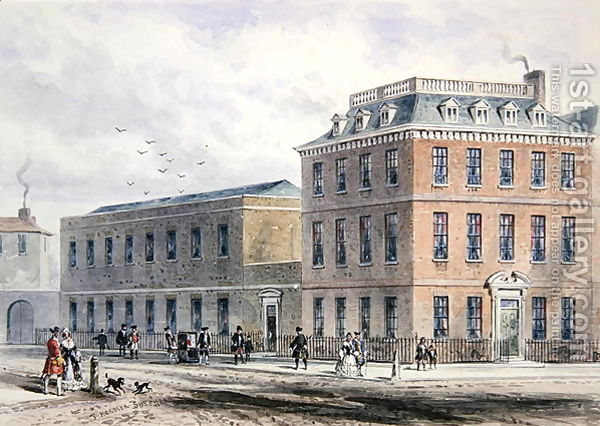 Such support allowed her to lease Carlisle House, Soho Square in May 1760 with her entertainments of dancing, gambling and refreshments, being the following autumn. Subscriptions were limited to the aristocracy and tickets cost 5 guineas. Using the potential profit from the sale of these tickets to her creditors she had the premises refurbished and expanded in the 1760s (these works included a Chinese room) and engaged both Johann Christian Bach and Karl Friedrich Abel to perform in 1763-4. In addition to concerns and balls Carlisle became quite infamous for the masquerades and for taking advantage of disagreements at the King’s Theatre to expand the opera performed at Carlisle House (these resulted in fines for violating the Licensing Act of 1737). 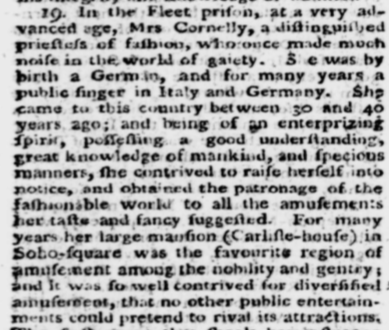 “The astonishing success of Teresa Cornelys as London’s greatest impresario of the 1760s contained the seeds of her eventual downfall. To attract fresh audiences every season she spent lavishly in an annual round of costly magnificence and innovation. Returns on her investment grew harder to yield when other entrepreneurs, senses quickened by the palpable success of Carlisle House, set up a to compete for the quality in one or other of the pleasures pioneered so successfully by Mrs Cornelys. The first blow fell in 1768. William Almack had kept a coffee house in Curzon Street, Mayfair, in the 1750s and then an alehouse in Pall Mall, which he later ran as a fashionable gaming house. He proposed sufficiently to build new assembly rooms in King Street, St James’s Square, opening in February 1765. There is provided weekly balls and gaming tables and extended his premises with a ‘great room’ fit for concerns in 1767. Like Mrs Cornelus’s early ventures, ton was assured by a ‘Ladies’ Coterie’ who vetted subscribers to exclude the unfashionable. And it was under their protection that Bach and Abel were seduced from Carlisle House to open a new concert season at Almack’s in 1768.” (p300). In 1771 Teresa retired to Southwark (adopting an alias of Mrs Smith) and the Gentleman’s Magazine of November 1772 listed her as a bankrupt. The following month Carlisle House and its furnishings were sold to her creditors (who included Thomas Chippendale). The auction raised £10,200 and Teresa was given an annual annuity of £200. The final years of her life saw a sad decline in her lifestyle selling milk to the ton. The other infamous Teresa was the member of post-French Revolution society, Mme Theresa Cabarrus Tallien, later Princess Chimay (July 1773-Jan 1835). Theresa was born in Madrid to a French financier (her father founded the Bank of San Carlos and was Minister of Finance to King Joseph I of Spain). She was returned to France to be educated and to find a husband. Despite having a lover (Alexandre de Laborde) her father married her to Jean Jacques Devin Fontenay, Marquis de Fontenay – she was 14. When her husband fled the country during the Revolution Theresa gained a divorce. Even though the marriage was ended she was arrested in Bordeaux because of her association with the aristocracy but was saved from the guillotine by Jean Lambert Tallien (they married in 1794), the Commissary of the National Convention. On their return to Paris she was re-arrested on the instruction of Robespierre and taken first to the infamous La Force and later in Carmes Prison. Her husband worked to oust Robespierre and Theresa was released on 27 July 1794. Due to her work to have detainee’s released she gained the nickname the ‘Notre-Dame de Thermidor’. However, it was her activities in Parisian society once the worst actions of the Revolution ended that really made her name. She took the classic Roman/Greek designs that had been popular and took them to a highly revealing extreme including arriving at the Paris Opera in a white silk gown with no underpinings. 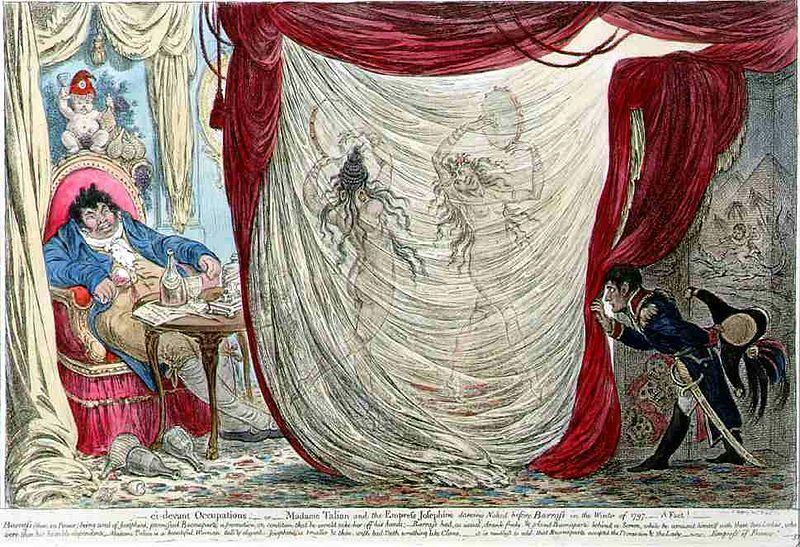 She was a member of the Merveilleuse who with their male counterparts the Incroyables led a decadent, exaggerated lifestyle during the French Directory of the years 1795-1799, that seemed more associated connected with pre-Revolutionary France. 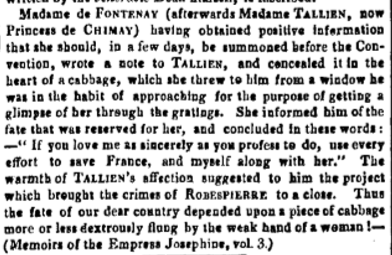 Tallien and Theresa divorced with 1802 and it appears likely that she had a brief affair with Napoleon and longer relationships with Paul Barras (who also counted Napoleon’s Josephine as a lover) and Gabriel Julien Ouvrand. However, it was Francois Joseph Philippe de Riquet, Comte de Caraman (later Prince of Chimay) she married in 1805. She and the Prince had a theatre built at the Chimay Chateau and at their own ‘court’ they were entertained by musicians such as Auber and Cherubini were invited. The couple lived out their lives at Chimay (which is a little over an hour’s drive from Waterloo). Two extraordinary Theresas – two women of the Eighteenth Century from different backgrounds who made a name for themselves in, and by challenging, Society. They both knew hardship & experienced the fears and dangers of imprisonment yet it is the manner in which they took on the expectations of those around them that led them to be remembered today.